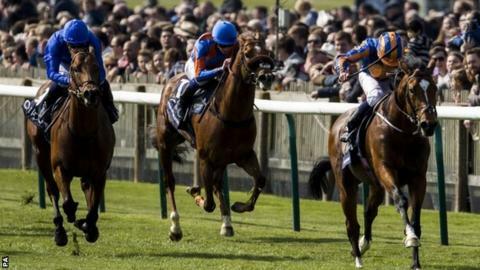 The 4-1 favourite Gleneagles claimed a convincing victory in the 2,000 Guineas at Newmarket, the year's first Classic. It was a first win in the race for former champion jockey Ryan Moore but a record-equalling seventh success for trainer Aidan O'Brien. Gleneagles had been unbeaten in his five races as a two-year-old and was well fancied coming into this race. Territories (5-1) was two and a quarter lengths back in second with Ivawood (10-1) in third. Gleneagles made the decisive move with a furlong to go and was easily able to hold off his rivals. The best horse with - all-importantly in this game - the most gilt-edged of pedigrees won having moved well all the way through, and asserted in style. The only real worry was that Gleneagles only 'does enough' so he found himself in front earlier than technically ideal (over a furlong from the finish), but that clearly made no difference. As well as the historic nature of the result, it marked a first big win for O'Brien and Moore since the jockey became the number one choice at Ballydoyle. O'Brien said: "He was always a good traveller. When he gets there he doesn't do much, but that was him last year as well. "His form was top class and he only does what he has to do. We always thought he would be a miler." Moore, who will be the senior rider for the Coolmore operation this season, added: "I'm looking forward to him for the rest of the year. He's a very exciting horse. "Aidan's record speaks for itself. He's achieved everything you can."